It has been a long time since I baked anything sweet in the oven. I am feeling 10 times better than 2 weeks ago prior to acupuncture and physiotherapy/rehab. I have gained a lot of my arm and physical strength back so it’s time for me to get back into action. We were given quite a bit of vegetables (potatos, carrots, zucchini, pumpkin) when we visited my sister at her marriage registration ceremony at her husband’s (Brad) parents place in Avon, Minnesotta. They own a large piece of land (about 50 acres I think) and his sister also owns a farm with cows, pigs and horses. So like most people in North America at the end of the summer, we ask the question, “What to do with all those zucchini?”. 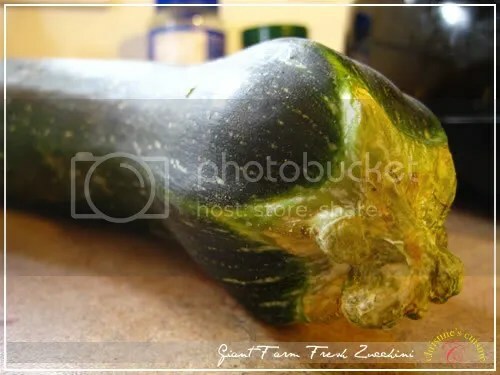 I have used them for my everyday mundane stirfries and roasting them in the oven, but I have yet to make desserts with zucchini. 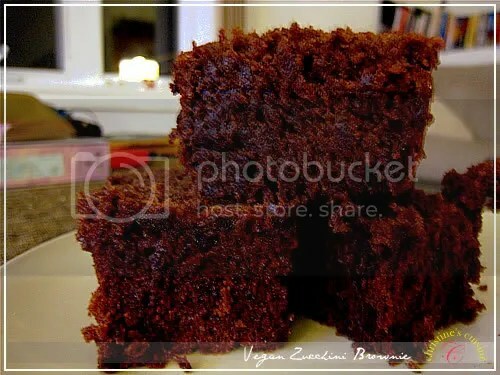 Most people would never think to use vegetables in dessert but I have tried zucchini breads and brownies before and they are super moist. So, with all the strength, determination and excitement that I have mustered up, and checking that I have all the ingredients that the recipe called for, I whipped up these brownies in no time. I also get to use my Mexican vanilla that I bought in May for the first time. I’ve heard rave reviews about them! It feels great to be baking and cooking again. I love feeling the creative juices and sense of order flowing through my body! Thanks again to those who stayed with me patiently through my whole ordeal. I am confident that with all the support that I am getting (despite my family being oceans away) that I will be doing just fine. This recipe is so easy, so do try to make some! Pre-heat oven to 350 F degree. Combine and sift dry ingredients (A) in a bowl. Add the wet ingredients (B) into (A) and mix well. Bake in an ungreased 9 x 13 inches pan at 350 degrees fahrenheit for 30 minutes. I used an 8X8 pan but it took longer because it was thicker. This entry was posted in Cakes n' Bakes. Bookmark the permalink. thank you so much for this recipe! I made it for my friend’s 18th birthday and everyone loved them…bravo! Thanks, Ashley. I’m glad that you and your friends liked it. Sorry for the late response. perfect use for the over sized zucchini i was given! i made 2 different batches, but for one of them used half oil and half mashed banana to but fat and calories and it worked just fine. thanks!